Recent political events vividly demonstrate how two terrible injustices, both related to racial equity, have severely twisted the social fabric of the United States. One of those injustices is the genocide of the native peoples in the Americas at the hands of European settlers starting in the late 1400s. The other is the enslavement of peoples of African origin, brought to the Americas as forced labor and human property for European settlers, starting in the early 1600s. There is no way for the United States to realize its full potential until, through the forceful action of the federal government, these two injustices are repaired to the fullest degree possible. Please take a moment to review these key inescapable facts, which are widely viewed as taking place too long ago to have immediate relevance in public policy choices. It was the avowed promise of many leaders of the United States and its states from the mid-1800s forward either to exterminate all native peoples to the last, or to move any remaining populations to small reservations in locations well away from any land of agricultural value, regardless of any formal treaties signed with the Indian nations. Complete loss of liberty under slavery. Government-sanctioned mass murder during the era of Jim Crowe. Planned segregation into multi-generational poverty through the urban renewal policies of the 1950s and 1960s. Mass incarceration starting in the 1980s. My reason for emphasizing these points is that efforts related to diversity and inclusion in the United States from the 1960s forward have diverted attention away from these two injustices. My complaint here is directed as much toward the liberal side of the political spectrum and policies, such as affirmative action in higher education, as it is toward the conservative side of the spectrum and its increasingly obnoxious and historically bereft myth of individual responsibility. Accompanying this column is one pervasive expression of how the conversation about racial injustice is quantified: the latest United States. 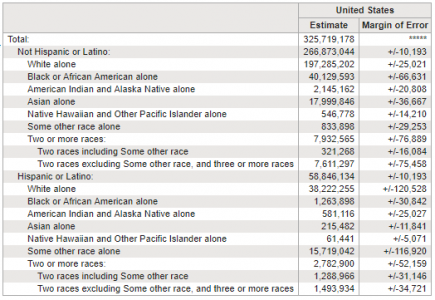 Census/American Community Survey counts the country’s population by race and ethnicity as of 2017 (numbers are from the ACS 2017 1-year table B03002). Looking at diversity in this representation conveys the idea that all diversity, and thus all issues of equity connected with diversity, are equal and mostly about achieving similar proportions of persons across all strata of the economy and society. That is the problem. The United States is not going to overcome the lasting legacies of the Native American genocide and the enslavement of persons of African origin by lumping them in with lawsuits against Harvard University regarding its admissions policies. This also is not about “Black politics” or “Latino politics” or any other politics connected to building a current political base; this is about dealing with crimes against humanity of the most grievous nature imaginable. With these injustices, the United States was born with a severe defect which continues to increase in expression and negative consequences the longer it goes unrepaired. Many people of good will in the United States would have testified in January 2009 that the country had finally shaken off the negative consequences of slavery and was ready to make real progress toward racial equity. Contrast that optimism with how these issues are playing out so vividly since January 2017! If you are reading this in the United States, please do not come back with the unacceptable reply that you personally have no direct connection to these issues because of some ancestral accounting that you think exempts you and all your relatives. First, your ancestors and mine going back generations participated in a political system at all levels that mostly covered up the racial injustices directed at the native peoples and the formerly enslaved persons of African origin. Second, your ancestors and mine benefitted in myriad ways from systems of injustice related to those legacies. There are many recent excellent treatises on those benefits in terms of economics and social mobility. We are all in this together, like it or not, and we are all being held back until we truly face up to the obligation to seek substantive restorative justice. I say this as the direct male descendant of a Union soldier who marched under General Sherman through the South, inflicting total warfare on the slave owners. I am just as obligated today as the unrepentant descendants of those slave owners who insist on waiving the Confederate battle flag. My next column will address some possible government measures for restorative justice that would be meaningful for the descendants of the persons who suffered mightily in this land since the late 1400s. I hope you will read it and join me in supporting a sincere push for justice that uses all the tools available to the federal government.